Showing 16 articles from December 16, 2013. Its official, we have a theme: The Wonderful Egg of Oz, submitted by Lori Stein on our Facebook page. We are now looking forward to all of the wonderful button art, posters and parade entries this theme has the potential of bringing us. Community members will need to mark their calendars because we’re changing things up a bit this year. We’ll be kicking things off with our coronation on June 27, and June 28 will be filled with everything else! We’re also happy to report that, although we’ll not be scheduling an out-of-town carnival, we will be bringing our own version of the carnival to town that Saturday. In response to a call for greater student security, the Winlock and Toledo School Districts have been looking at a new app-phone based technology enabling them to initiate lockdowns from mobile devices. School Alert, a program by Helix Group, based in Tumwater, is an app that can be downloaded on smart phones and tablet computers and allows an instructor, staff member or administrator to remotely alert law enforcement of a threat at a school, as well as enable automatic lockdown procedures through door locks and the intercom system. The last chance to sign up for an Obamacare policy that takes effect in January is Dec. 23, though open enrollment will continue afterward. While websites at the Federal level have been notoriously difficult to access, Washington has its own website (www.wahealthplanfinder.org), which has worked without problems. For the second year since last December, area residents are placing pictures and mementos at the Memorial Tree on Collins Rd., just outside Toledo. Started by resident Sue Hill to remember her recently-passed uncle, whom Hill said frequently stated the stately tree at the intersection of Collins Rd. and SR 505 ought to be decorated for Christmas, the memorial coincided with the massacre at Sandy Hook Elementary School, which took place one year ago Saturday. Residents in the Vader area are still able to register for the Strengthening Families Program, which starts Jan. 14 and is sponsored by The Castle Rock CARE Coalition. Organizers have said, while the program has been historically held in Castle Rock, the attendance of Vader students at Castle Rock Elementary School has shown a need to bring the program to Lewis County, as well. The Toledo School District is asking local residents to weigh in on how they think the district ought to continue or change they way they do business, including feedback about programs, facilities, staffing and anything else they feel is worth noting. The district has acquired the help of Thought Stream, a software company specializing in taking public opinion and finding the common denominators that could turn into new policy decisions. The information and perspectives currently being collected are entirely open-ended, and residents from within and without the district will be able to participate. To join the conversation, go to http://thotstr.ca/toledo/WCd. The opportunity to provide input during this first round will end Dec. 20. The snow is gone (or the first one, in case there’s more before this gets printed) and it’s not nearly as cold. Beautiful foggy mornings, partly sunny days: not too shabby for this time of year. I have family driving and flying here for Christmas, so I hope they don’t run into any travel problems. The "It’s a Wonderful Life" in Ryderwood Christmas Party has not happened by the time of this writing, but I’m certain a fantastic time was had by all. I plan to have a delicious burger at the Café and then go across the street and enjoy dessert at the party. Traveling through the season with Santa finds me behind on my technology updates. Since I have yet to get all my devices connected, I am free-wheeling this week. Kudos to the high school students, who artfully dressed all the windows throughout the downtown area. And have you noticed the lights on the new riverfront park gazebo? 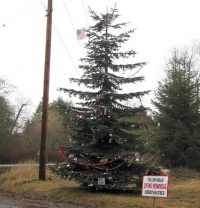 Memorial Tree decorated at SR 505 and Collins Rd. deserves more than a snapshot. Make the trek. The Winlock Senior Center is having their Christmas lunch on Wednesday. They will be serving roast beef, potatoes, vegetables and dessert. Joann and Gary Parkinson volunteer at the Senior Center and have been married 56 years this past Saturday. Congratulations! Arthur Wayne Bluhm, of Napavine, died Dec. 7, 2013. Born July 7, 1931, he was 82 years old. It is hard to tell a coach that two of his team's most important games come in the first two games of the year. 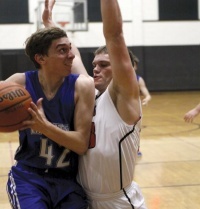 Toledo dropped the first test to Woodland, but in the latest game, managed to hold off La Center 45-44 in early season Trico League play. Crime Stoppers of Lewis County and the Lewis County Sheriff’s Office are seeking assistance in a theft investigation. Between Nov. 1 and Nov. 3 suspect(s) entered a residence on the 500 block of Coal Creek Rd., Chehalis and the stole an Apple Mac Book Pro, Model #A1286, a Bulova men’s gold wrist watch, with diamonds set in the face for each hour, a Washburn acoustic electric guitar, black w/pearl inlays and hard case, and a gold-melting torch. The estimated loss is more than $4,350. Those who may have been let down by The Hobbit: An Unexpected Journey will certainly feel satisfied by The Hobbit: The Desolation of Smaug. A smarter, faster-paced flick than its predecessor, The Desolation of Smaug works well because of its faithful use of the source material, as well as the strength of new characters and plot lines meant to fill out the movie. After having gone through a few different incarnations recently, The Tea Cup has now filled the space formerly occupied by Hatties, in Castle Rock, and has begun serving food, as well as a large assortment of teas. 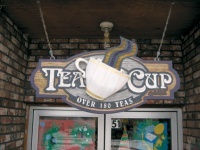 Started originally in the Chehalis area by owner Kathi Rogers, The Tea Cup lays claim to more than 180 varieties of tea, both exotic and familiar, with purchases available both by-the-cup and by-the-ounce. Rogers said a number of blends, primarily local, do very well, including Cream Earl Grey, Market Spice and Sunset in Seattle. Personal finance: Why was your credit card transaction denied? We've all had these moments: You're at a romantic restaurant and the evening went great. But just as you and your date are readying to leave, an embarrassed waiter appears and whispers, "I'm afraid your card has been denied." So much for romance. The same thing can happen at the grocery store, when shopping online or worst of all, when you're traveling and don't have a back-up means of payment. Why do credit card transactions get denied and what can you do to prevent it?